54 F A ll 2018 Practice l ink.com features There are physicians, and then there are Signature Physicians. Join a winning team. Over 150 physicians have made Signature Healthcare their choice. At Signature Healthcare, physicians are the foundation of our team, with physician representation on our board of directors, integrated care coordination with support staff, and full marketing assistance. Signature Healthcare is an environment where a practice can grow and a physician can excel. 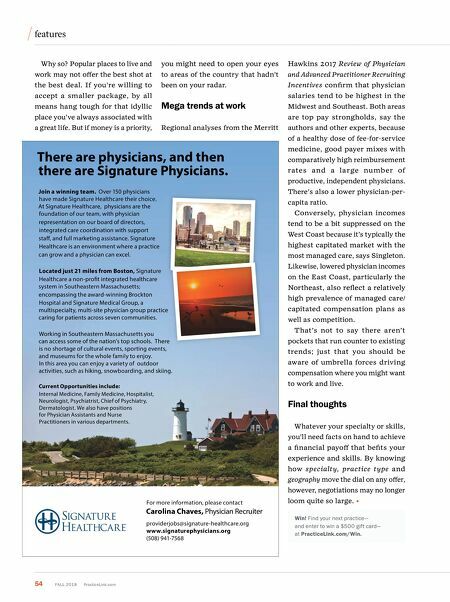 Located just 21 miles from Boston, Signature Healthcare a non-profit integrated healthcare system in Southeastern Massachusetts; encompassing the award-winning Brockton Hospital and Signature Medical Group, a multispecialty, multi-site physician group practice caring for patients across seven communities. Working in Southeastern Massachusetts you can access some of the nation's top schools. There is no shortage of cultural events, sporting events, and museums for the whole family to enjoy. In this area you can enjoy a variety of outdoor activities, such as hiking, snowboarding, and skiing. Current Opportunities include: Internal Medicine, Family Medicine, Hospitalist, Neurologist, Psychiatrist, Chief of Psychiatry, Dermatologist. We also have positions for Physician Assistants and Nurse Practitioners in various departments. 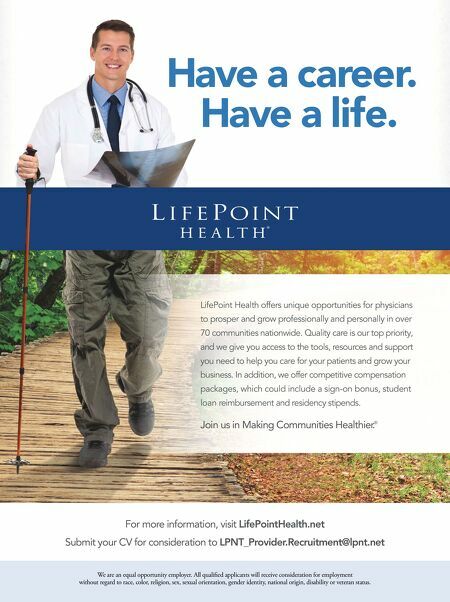 For more information, please contact Carolina Chaves, Physician Recruiter providerjobs@signature-healthcare.org www.signaturephysicians.org (508) 941-7568 Why so? Popular places to live and work may not offer the best shot at the best deal. If you're willing to accept a smaller package, by all means hang tough for that idyllic place you've always associated with a great life. But if money is a priority, you might need to open your eyes to areas of the country that hadn't been on your radar. Mega trends at work Regional analyses from the Merritt Hawkins 2017 Review of Physician and Advanced Practitioner Recruiting Incentives confirm that physician salaries tend to be highest in the Midwest and Southeast. Both areas are top pay strongholds, say the authors and other experts, because of a healthy dose of fee-for-service medicine, good payer mixes with comparatively high reimbursement rates a nd a la rge nu mber of productive, independent physicians. There's also a lower physician-per- capita ratio. Conversely, physician incomes tend to be a bit suppressed on the West Coast because it's typically the highest capitated market with the most managed care, says Singleton. Likewise, lowered physician incomes on the East Coast, particularly the Northeast, also reflect a relatively high prevalence of managed care/ capitated compensation plans as well as competition. That's not to say there aren't pockets that run counter to existing trends; just that you should be aware of umbrella forces driving compensation where you might want to work and live. Final thoughts Whatever your specialty or skills, you'll need facts on hand to achieve a financial payoff that befits your experience and skills. By knowing how specialty, practice type and geography move the dial on any offer, however, negotiations may no longer loom quite so large. Win! Find your next practice— and enter to win a $500 gift card— at PracticeLink.com/Win.